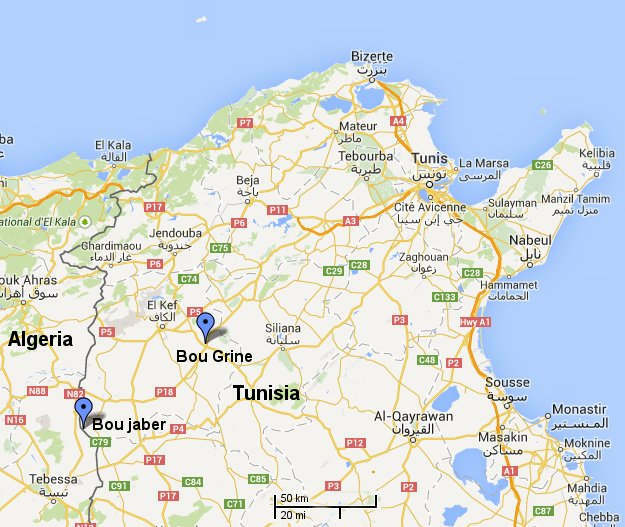 Decrepitation data on Pb-Zn deposits in Tunisia, North Africa. Samples were collected for baro-acoustic decrepitation analysis at 3 different Pb-Zn deposits in northern Tunisia in 1987. These deposits are carbonate hosted "mississippi valley" type (MVT). They were formed at low temperature from sedimentary basin fluids. Microscope observations showed the presence of hydrocarbons in some fluid inclusions in these samples. Samples were collected from the Bou Grine, Bou Jaber and Fedjal Joum deposits. (Fedjal Joum is probably my misspelling of "Fej Lahdoum", "Fedj el Adoum" or "Fedj el Hadoum" referred to in other publications). Baro-acoustic decrepitation is usually carried out on quartz samples. But quartz is not present in these deposits and various other minerals were used instead. Baro-acoustic decrepitation does NOT require transparent host minerals and can be used on opaque minerals. However, the decrepitation result is influenced by the host mineral and data from these samples cannot be compared directly with results from different mineral hosts. Consequently the main interest in this data is to compare the decrepitation within and between various minerals rather than to try an determine fluid conditions and temperatures during deposition. Note that the 2 samples from Bou Grine show no significant decrepitation at all and these samples are probably unaltered limestone sediments. All of the samples of baryte came from the Bou Jaber mine. They show intense decrepitation, which is common for baryte samples based on results from the Roxby Downs mine in South Australia. Because of the ductility and cleavage of baryte, which facilitates post-entrapment modification of the fluid inclusions, it is unclear what meaning can be derived from the decrepitation temperature. Additional baryte data is here. 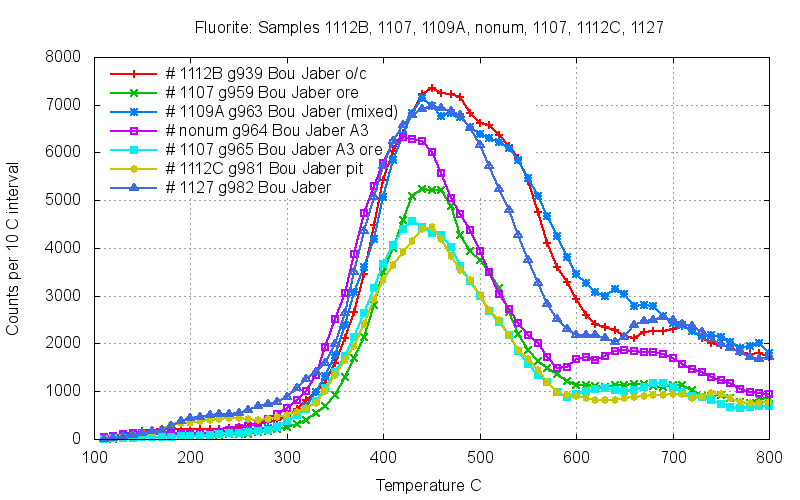 All of the fluorite samples also came from the Bou Jaber mine. They show intense decrepitation as do other fluorite samples (shown here) except for synthetic fluorite intended for optical usage. The fluorite decrepitation is almost identical to the baryte decrepitation. It is suspected that the fluid inclusions in fluorite are easily modified post entrapment and the meaning of the actual decrepitation temperatures is unclear. The 3 samples below contained a mixture of both heavy and light minerals, and a density separation was carried out using tetrabromoethane (TBE), density 2.97 g/cc. These low density fractions, which would include quartz and limestone, show only low intensity decrepitation. Based on the lack of decrepitation above 600 C, these samples are probably mostly quartz. The data suggests that a siliceous fluid event at about 300 C occurred in this mine. Because galena is ductile and has strong cleavage it is a poor host for fluid inclusions and although its decrepitation response is interesting it should not be relied upon to determine formation temperatures. 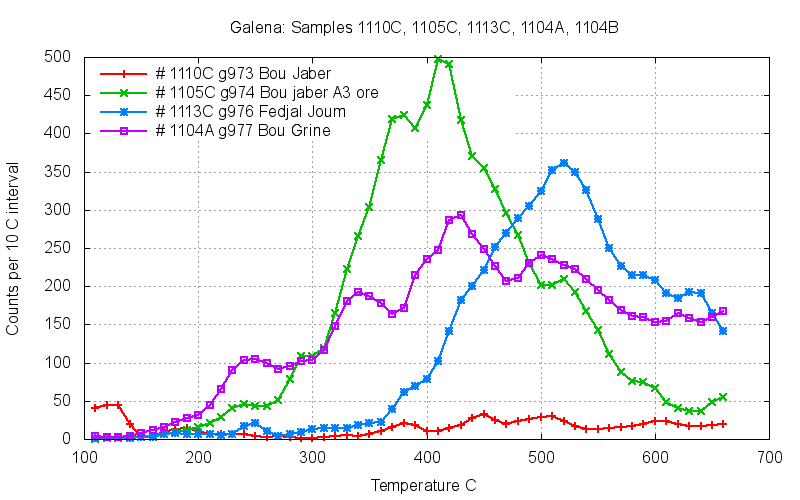 These results show major differences between galena samples, even between the 2 samples from the same mine, Bou Jaber (red and green curves). Additional examples of decrepitation of galena are here. Sphalerite should be a good host for fluid inclusions and is sometimes used for microthermometry because it is sometimes slightly transparent. 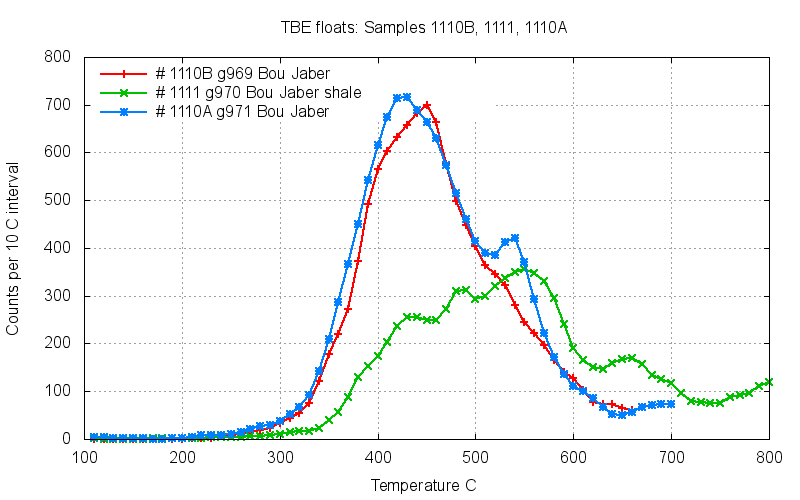 Three of these samples, 1110B, 1104A and 1110A have low decrepitation suggesting a formation temperature of about 320 C. This temperature is higher than expected for these MVT type deposits. 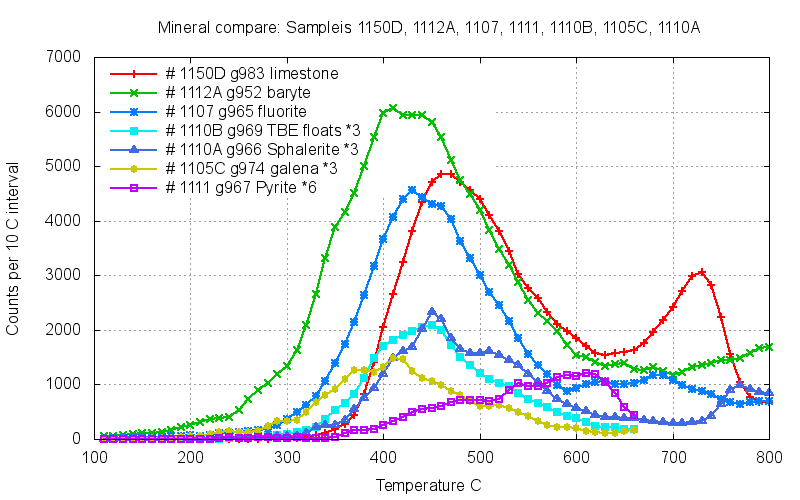 Sample 1113B (green curve) was a mixture of sphalerite with baryte and this peak is most likely dominated by decrepitation of the baryte component rather than sphalerite. 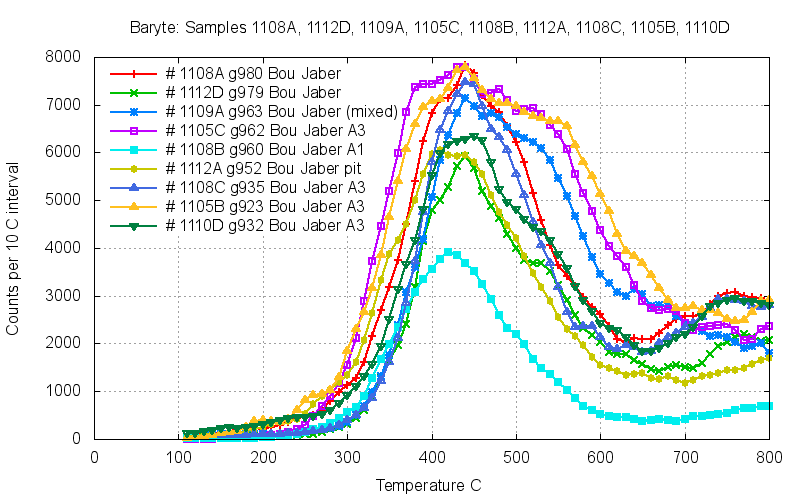 Sample 1104B (yellow curve) is surprisingly intense, but also at unusually high temperature and is probably not caused by baryte contamination. The meaning of this decrepitation response is unclear. 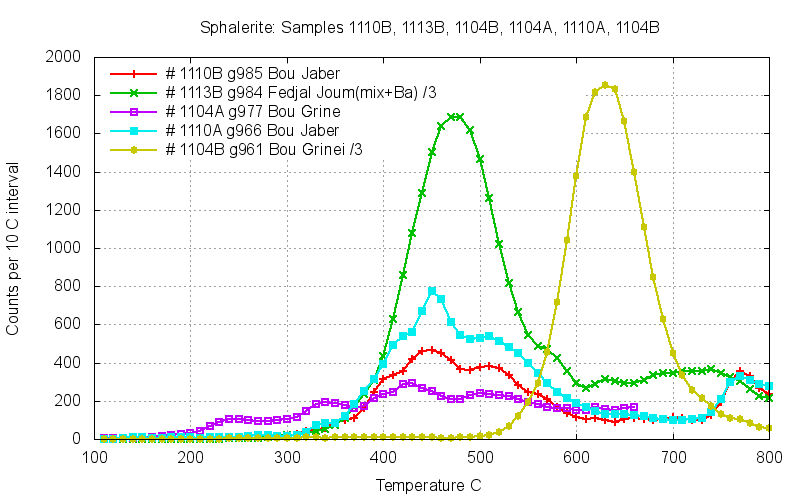 Additional data on decrepitation of sphalerite samples is here. Pyrite is often useful in decrepitation studies and has been used at Chessy in France, and at Kalgoorlie in Western Australia and other studies. 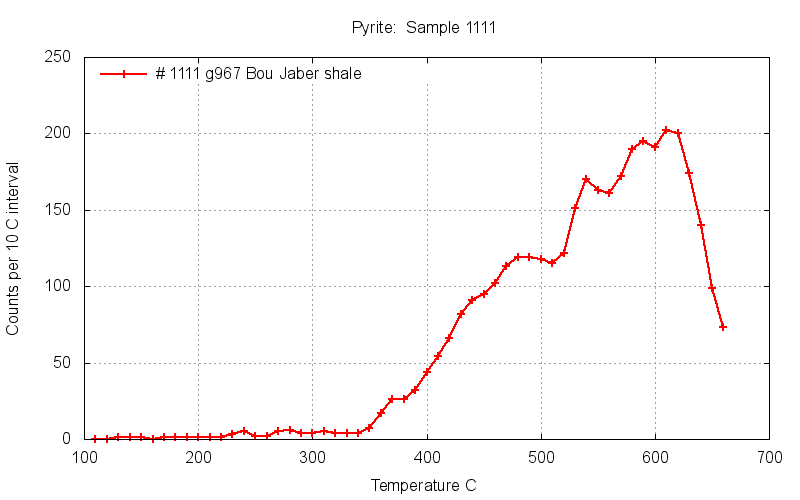 Pyrite frequently gives intense decrepitation, but at Bou Jaber in sample 1111 the pyrite had only weak decrepitation. This was the TBE gravity separated heavy fraction of sample 1111. The decrepitation temperature seems much higher than any expected formation temperature for the pyrite and it is unclear if there has been a high temperature event in this area or if this decrepitation temperature is unrelated to the formation temperature. To show the differences between different mineral hosts, one sample from each mineral species is plotted here. Note that 4 of the plots have been multiplied to facilitate comparison at this scale. All of this minerals can provide decrepitation data, but it is not easy to interpret the results in minerals which may have allowed post-entrapment modification of the primary fluid inclusions. To use decrepitation on such mineral hosts it is necessary to only compare and contrast data from the same mineral. The decrepitation results from these samples in Tunisia are difficult to interpret because of the many different mineral species collected and the unavailability of a single common mineral host in all the sample locations. 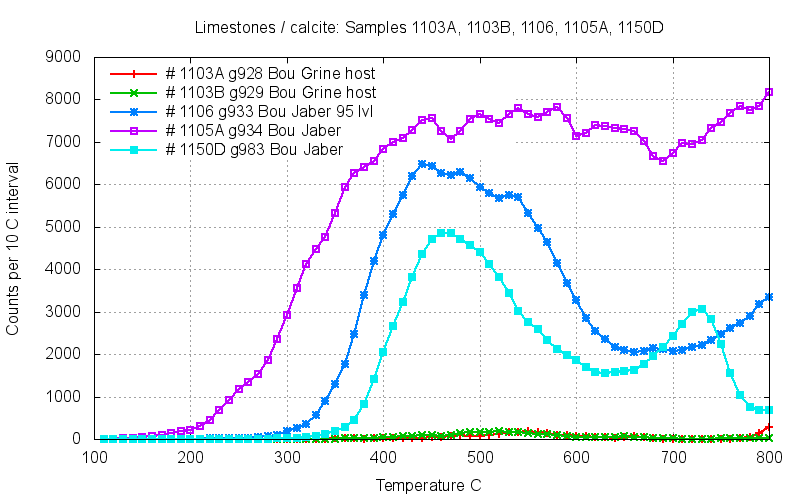 Despite this, decrepitation does not usually start below a temperature of 300 C, except for baryte samples. Perhaps there has been a late stage fluid event or metamorphic event near this temperature. And the baryte may have deposited and be reflecting a lower temperature during retrogression. However other studies on these deposits generally infer a formation temperature closer to 150 C from hot basin fluids and do not support the idea of fluids or events as hot as 300 C.
Further research is necessary to properly understand this decrepitation data and the formation temperature of these MVT deposits in Tunisia.